Situated at an altitude of 1938 m (6,350 ft) above sea-level, Nainital the charming hill station, is located in the Kumaaon region of Uttarakhand State. Dotted with lakes, Nainital is said to be the 'Lake District' of India. Since Nainital had many number of lakes previously this was called Chakta or the city of 60 lakes. Today most of the lakes have disappeared. According to a legend which associates with this place, the eyes of Sati (hence naina), consort of Lord Shiva fell at this spot. There is even a temple located at the northern end of the Naini Lake (In hindi, Tal means Lake) dedicated to Sati, who is revered as Naina Devi. One of the most pleasant hill stations to visit, Nainital was discovered by Mr Barron, a European manufacturer in 1841. This was once the Summer Capital of Uttar Pradesh, and this lake resort has many interesting walks along narrow wood lanes forests of oak, pine forest trails in the neighbouring woods. This beautiful place offers many options like boat cruise at lake, water sports like Yachting, Kayaking, Canoeing , horse riding, trekking etc. From just near the Tibetan Market, the famous Naini Lake stretches for about 1370 m in length, 360 m in breadth and depth of 28 m. This beautiful lake is a favorite haunt of tourists. 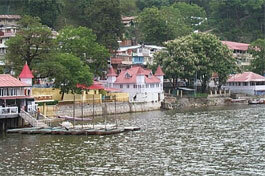 Surrounded by forested mountains, Naini Lake is the central and strategic attraction of Nainital. According to Hindu mythology, the lake is one of the green eyes of Goddess Parvati (Lord Siva's wife). She had jumped into a sacrificial bonfire and her husband (Siva) dragged her charred remains across the country, various appendages dropped off. Her eye falling here make this lake as a holy spot. The popular Naina Devi Temple was built on the northern end of this lake and was destroyed by the landslip of 1880 but it was subsequently replaced by a modern structure which is a popular Hindu pilgrimage. The north end of lake is called Mallital and the southern one is called Tallital which have a bridge having Gandhiji's statue and post office on its sides. For those who like to enjoy yachting, boating or paddling the boat, a visit to this Lake is a must. There are many points where you can rent row boats at very reasonable rates. Special permission is required from The Nainital Boat Club to hire yachts (05942-235318). An annual Kingfisher Yachting Competition held during the third week of June attracts a lot of tourists here. You can also enjoy horse riding along the lakeside. Several shops near the lake, where you can buy shawls, ready-mades, local handicrafts, pickle, juice etc. The most spectacular is the scene when night descends and the reflection of lights from the pretty cottages and villas adds more beauty to this lake. Situated near the Nainital Club, this is one of the oldest buildings in Nainital built in 1847. With some architectural specialties, this reminds the memories of the British Raj. A brass memorial is kept in memory of the victims of the famous landslip. The few bodies which could be dug out were buried the church's graveyard. Situated just 6 km away from the Nainital town, Naina Peak is approximately 2611 mts above sea level. Also known as the China peak, this is the highest peak of Nanital. It gives a breathtaking view of the snow-capped Himalayan ranges including Nanda Devi (7,816m), mountains on the Tibetan border and a bird�s eye view of the entire Nainital. A very good trekking spot. One can either trek or go on a horse back up to Naina Peak. Just 3km from the lake Astronomical Observatory the observatory is the most modern in India with satellite tracking cameras and big telescopes. Stand on Manora Peak, this is situated at an altitude of 1950 metres above sea level. The telescopes and binoculars set up here offer spectacular views of the valley. Open Monday to Saturday from 10am to 5pm and can be visited by prior appointment on certain days. Contact at the tourist office. There is also free slide show between 1.30 and 3p.m. It was built by an Englishman named Kellet in memory of his wife Mrs. Kellet Dorothy. Dorothy's Seat also known as Tiffin Top is a perfect vantage point commands a bird's eye view of the distant mountain ranges and a sectional view of Nainital. It is a short trek of about 3 kms from Nainital situated at an altitude of 2292 m above sea level. It is another good vantage point for viewing the snow capped Himalayas. Situated at a height of 2270 meter above sea level and 3 kms from the Nainital town, this is one of the most visited tourist spots in Nainital. The spot is accessible through ropeway from Mallital, horse riding or by simply trekking. The scenic view from the Rope Way cabin is absolutely mind-blowing. It's fare is Rs. 65 per hr. Timings 9 am -5pm. This is a small temple, dedicated to Lord Hanuman which is also a wonderful place for sunset view. This falls on the way to the observatory and the Sanjay Park or the Botanical garden. On the other side of the hill there is Shitala Devi temple and Ashram of Lila Sah Bapu. It is 4 km from Nainital town, situated at an at an altitude of 2118 mts from the sea level. From Land's end one can enjoy the charming view of the beautiful lake Khurpa Tal and the surrounding places. This place is accessible either by a horse ride or a short trek. This is another beautiful lake in Nanital. The lake inhibits a large varieties of breeding ground of fishes. It is nearly 12 km from Nainital. The Govind Ballabh Pant High altitude Zoo is at an altitude of 2100 meters in an extensive open area. It has monkeys, Himalayan black bear, Leopard , Siberian Tiger, Palm civet cat, Wolf, Silver Pheasants, Rose ringed Prakeet, Hill Fox, Ghoral, Barking Deer, Sambhar. It is 1706 mts above the sea level and 11 km away from Nanital. It is famous for its magnificent sceneries. Also famous for hill fruit mart. Bhowali is also known for its T.B. sanatorium established in 1912.